History, convention wisdom and just plain common sense tells us that, with all things relatively equal, the good big man more often than not prevails over the good little man in boxing. It might sound like an overused cliché, but it has proven to be a reliable rule of thumb. Mikey Garcia (39-0, 31 KOs) will attempt to defy conventional wisdom when he rises two divisions to dethrone Errol Spence Jr. (24-0, 21 KOs) for a 147-pound alphabet belt on Saturday. 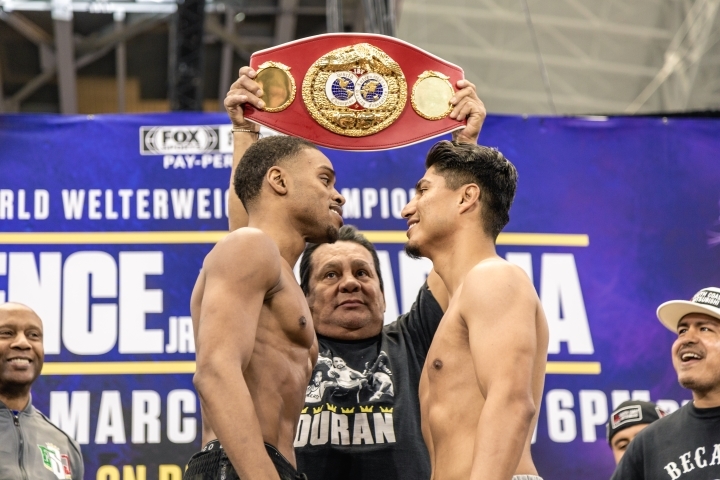 Spence, 29, and Garcia, 31, are at or near the primes of their careers, both are ranked in most pound-for-pound lists and, taking into account Spence’s stellar amateur credentials, both are on relatively equal footing in terms of experience. Garcia did his best work in the 126- and 130-pound divisions. But at 135 and 140, his punching power simply wasn’t as devastating as it was against the smaller guys. Let’s look at Garcia’s record (4-0, 1 KO) in world title fights at 135 and above. Granted he won his first 135-pound title by blasting out Dejan Zlaticanin in three one-sided rounds, but Zlaticanin was an unheralded European fighter who won a vacant alphabet title from another unheralded European fighter. The fact that Zlaticanin was subsequently stopped by a 17-2-1 fighter suggests that he was merely a caretaker titleholder who was there for the taking. Garcia’s foray into 140-pound territory was against two diametrically polar boxers. He handily beat Adrien Broner, an experienced but underachieving high-profile fighter, who like Garcia, was also most impressive at lighter divisions. Garcia subsequently snatched his fourth world title in as many divisions by decisioning Sergey Lipinets who had dethroned an obscure Japanese fighter for the alphabet belt. A converted kickboxer, Lipinets proved tough, determined but, at 13-0, woefully underexperienced in the sweet science. In his most recent fight, Garcia dropped back down to 135 and effortlessly nullified a five-inch height disadvantage to methodically outpoint Robert Easter to partially unify the lightweight championship. Although he scored knockdowns against Easter and Lipinets with left hooks, he never came close to stopping them. It underscored the fact that Garcia’s firepower is not what it used to be in leaner territories. While Garcia’s knockout percentage has dipped, Spence has stopped his last 11 opponents, seven of whom had never previously been stopped. The knock on Spence, though, has often been that he has fought mostly carefully selected untested and/or smaller opponents that had recently come up in weight. But in his most impressive victory to date, Spence dominated and stopped Kell Brook, a full-fledged welterweight whose only loss was to the best middleweight in the world at that time. In that fight, Spence not only showcased a PhD-level boxing IQ, he also outfought a fearsome brawler in the trenches. Against Brook, Spence dispelled many doubts about his heart, chin and ability to deal with adversity. Most significantly, if Spence has an Achilles heel, it has yet to be exposed. Did Garcia and his team detect a weakness that no one else has seen in Spence that they could exploit? Will the larger-framed Spence, at 5-foot-9½, effortlessly walk down the 5-foot-6 Garcia? Can Garcia effectively add that much muscle in such a short time frame? Is it simply a win-win gambit for Garcia – if he wins, his superstardom skyrockets exponentially; if he loses, he lost to a bigger, stronger man and his stock doesn’t take that much of a hit? Will Spence underestimate Garcia and come in less prepared than he would be against a legitimate welterweight? In the first ever matchup between two two-time Olympic gold medalists, unified WBA/WBO 122-pound titleholder Rigondeaux moved up to 130 to challenge Lomachenko for his title. Lomachenko beat Rigondeaux to the punch all night and punished him with shots from various angles before the Cuban quit in corner after the sixth round. Inoue, just 7-0 (6 KOs) at the time, held a 108-pound belt and put on seven pounds to challenge long-reigning 115-pound titleholder Narvaez whose only loss at that time was a lopsided decision to 118-pound titleholder Nonito Donaire. Displaying a fearsome arsenal, Inoue tore into Narvaez from the opening bell dropping him twice in the first round with a straight right and then a counter left hook to the head before knocking him out with a savage combination to the body in round 2. Undefeated at 36-0 at the time, Brook was considered among the best boxers in a talent-rich welterweight division. But Golovkin was top dog in the middleweight division, holding three of the four alphabet belts at the time. Golovkin’s edge in size and power was evident from the outset but Brook had his moments as he stood toe-to-toe with the bigger man. In the fifth round, Brook was having vision problems due to a fractured eye socket prompting his corner to throw in the towel. Pacquiao dominated De La Hoya throughout with his blistering hand and foot speed coupled by relentless pressure and accuracy forcing De La Hoya to capitulate at the end of the 8th round. It would be De La Hoya’s last fight. Like Garcia, Pacquiao had to overcome a substantial size disadvantage having never campaigned above 135 pounds prior to this fight. Pacquiao, standing only 5-5½, began his career at age 16 as a puny, undernourished 106 pounder and gradually bulked up to win titles at 112, 122, 126, 130 and 135. At 5-10½, De La Hoya captured world titles at 130, 135, 140, 147 and as high as 154 and 160 before dropping back down to 147 where he was most comfortable. But the bout was fought at a catchweight of 145 and De La Hoya seemed drained from shedding those extra two pounds. Spinks was the unified and undefeated light heavy champion who had run out of challenges at 175. Holmes was 48-0, had defended his title 20 times since 1978 and was universally recognized as the heavyweight champion of the world. He too had run out of heavyweight challengers. In a fiercely-contested battle, Spinks overcame the size deficit to outwit and outwork the bigger man to eke out a narrow but unanimous decision in a monumental upset to become the first light heavy champion to dethrone the heavyweight king. Alternating between boxing and brawling, Spinks rarely allowed Holmes to impose his will and power. Some have argued that Holmes, at 36, was a faded fighter, but consider his body of work after that loss; In the rematch Holmes turned the chess match into a prison brawl, winning 11 of 15 rounds only to be robbed of the decision in one of boxing’s biggest travesties. In 1992, he upset an 18-0 Ray Mercer. Later that year, he pretty much held his own against in a loss to Evander Holyfield in his prime for the unified championship. And in 1995, at age 46, Holmes fell a hair short of regaining a world title in a loss to Oliver McCall by a razor-close decision. Like Garcia, Duran was a unified lightweight champion who moved up two divisions to challenge Leonard at welterweight. Public persona-wise, it played out like a good-vs-evil encounter – a sneering, snarling brute with a devil-may-care attitude against a charming, handsome and articulate Olympic gold medalist. Goading Leonard to fight his fight, Duran effectively nullified Leonard’s advantage in speed and savvy by turning it into a street brawl. For 15 scintillating, action-packed rounds the two legends traded savagely in the trenches, each taking turns at ripping vicious punches at each other, neither willing to give an inch. At the end of the day, Duran was awarded the decision by the narrowest of margins. In the rematch, Leonard refused to be lured into a brawl. Instead, he slickly boxed, taunted and humiliated Duran into walking away from the fight in the eighth round in the now-infamous “no mas” fiasco.